Gemini are intriguing and complex creatures. They are mercurial, versatile, love to travel and to go on new adventures. However, once they have found “The One” they are extremely loyal. 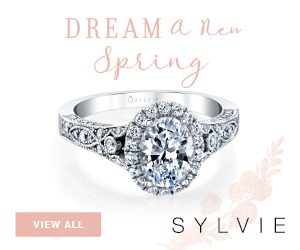 If you are dating a Gemini or a Gemini yourself, you should look into engagement ring options that are unique, paying homage to the double/twin personality or versatile to keep the wearer exploring and guessing. The emerald is the May birthstone. It is a very precious gemstone with unique inclusions. It is very rare to find two stones with the exact same “flaws”. They are a great fit for a Gemini. Beautiful emeralds can get pricey. The Takat couture pieces, big, bold and beautiful are always fun to try on. For those of us who are not part of the billionaire’s club yet, this charming white gold engagement ring with diamonds and an emerald center is a great pick. Gemini should also look into Csarite engagement rings. This amazing gemstone changes color from subtle green to rose gold and every shade in between, depending on the weather and the type of lighting indoors. It will take on a dark gold shade in candle light. It can also reveal itself in khaki greens, cognac pinks, canary yellows, pinkish champagnes, sage greens, raspberry purplish-pinks and vibrant gingers. These colors can appear solid or mixed together. With each day and situation comes a new surprise. The ring below is designed by Kari Jamieson. It features a rose gold split shank setting with diamonds and a stunning Csarite center. Let’s move on from color centers and pay homage to the legendary duality in Gemini. This Ever Us two stone ring with Forevermark diamonds features two twin diamonds. You can even customize it with other diamond shapes like pears, or mix of pear and rounds, or decide to switch to platinum or yellow gold. I also love this engagement ring setting with two twin diamonds and an eternity sign halo to symbolize two hearts and love everlasting, designed by Danhov. 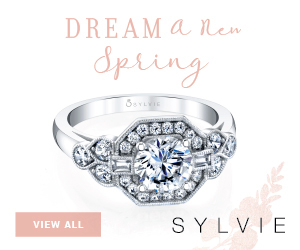 Last but not the least, for the Gemini who is also a fashionista, I recommend picking an engagement ring that comes with a myriad of stackable band options. 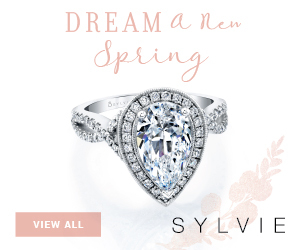 You’ll be able to build a collection to change your engagement ring look as often as your mood or wardrobe changes. 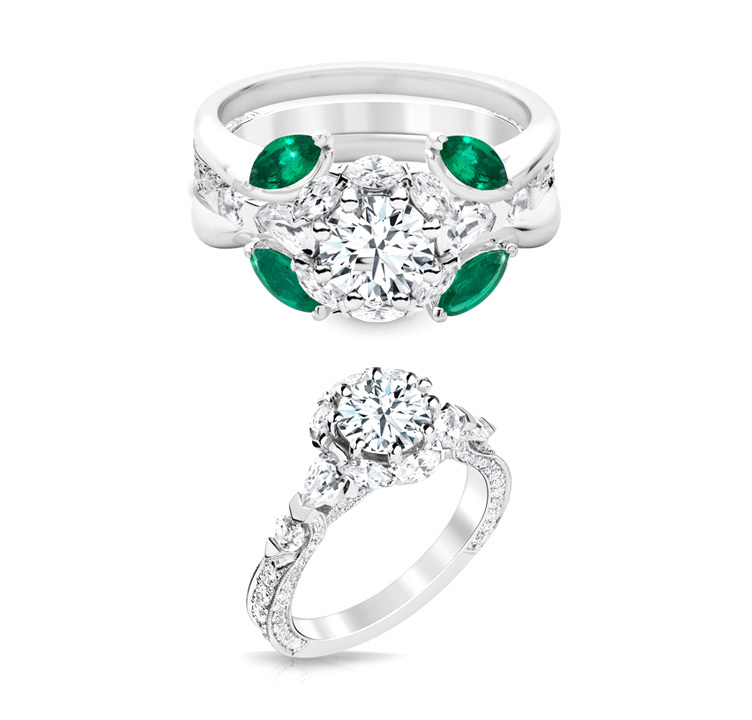 Look how different this LX-Antwerp engagement ring looks stacked with two bands with marquis shaped emeralds. 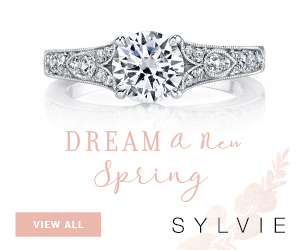 Imagine other combinations with rose gold, pavé diamonds, plain bands… Your imagination is limitless so you’ll never get bored! Astrological birthstone are different from regular birthstones. You can find all birthstones suitable for engagement rings here.